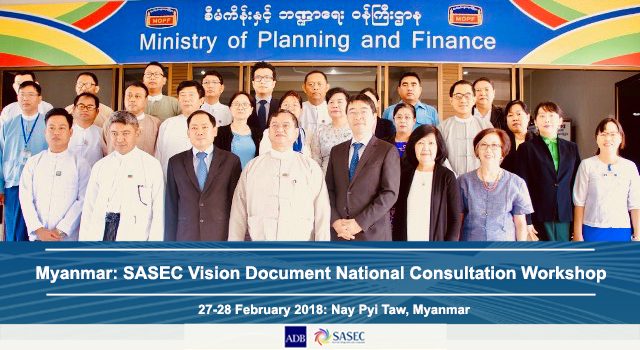 The National Consultation Workshop for the draft Myanmar chapter of the SASEC Vision document was held in Nay Pyi Taw, Myanmar, on 27-28 February 2018, hosted by the Government of Myanmar's Ministry of Planning and Finance, with assistance from the SASEC Secretariat. Initiated discussions on potential regional initiatives that could open new opportunities in various sectors. Mr. U Tun Tun Naing, Permanent Secretary, Ministry of Planning and Finance delivered welcome remarks. Mr. Newin Sinsiri, Country Director, Asian Development Bank Myanmar Resident Mission, gave the opening remarks. Both Mr. Naing and Mr. Sinsiri highlighted Myanmar's unique advantage of pooling together complementarities between South and Southeast Asia toward the path to pan-Asian integration. The Workshop was attended by 26 participants, with senior officials from various government agencies, including the Ministries of Planning and Finance; Transport and Communication; Electricity and Energy; Labour, Immigration and Population; Industry; Commerce; Construction; and Hotels and Tourism. The Union of Myanmar Federation Chamber of Commerce and Industry also attended, representing Myanmar's private sector. The SASEC Vision is the long-term strategy of the SASEC program. It lays out a plan to transform the subregion by leveraging natural resources, promoting industry linkages for the development of regional value chains, and expanding the region's trade and commerce through the development of subregional gateways and hubs. 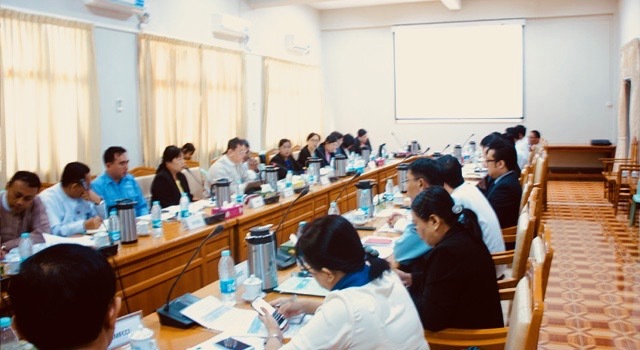 The SASEC Secretariat held a series of national workshops in all SASEC countries to ensure a full consultative process in preparing the SASEC Vision. The SASEC Vision Document National Workshop was funded by ADB technical assistance.